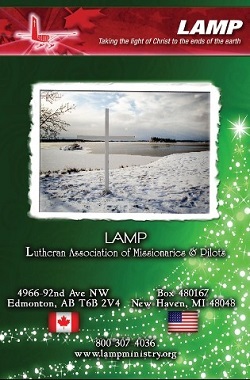 CANADA – LAMP (Lutheran Association of Missionaries and Pilots) has released their Advent devotional for 2015. The devotional is available for download from LAMP’s website at www.lampministry.org/advent/. You can also receive the devotions daily by email or request a print-copy by mail. LAMP is a Listed Service Organization of Lutheran Church–Canada committed to “sharing Jesus Christ with God’s people in remote areas of Canada.” Since 1970, LAMP has provided Gospel proclamation and pastoral care throughout remote areas of northern Canada through the ministry of pastor/missionary/pilots, and short and long-term volunteers-in-mission. More than 60 communities in remote Ontario, Manitoba, Saskatchewan, and British Columbia benefit from the work of LAMP.